But here is the time to appreciate those treasures found in the garden! 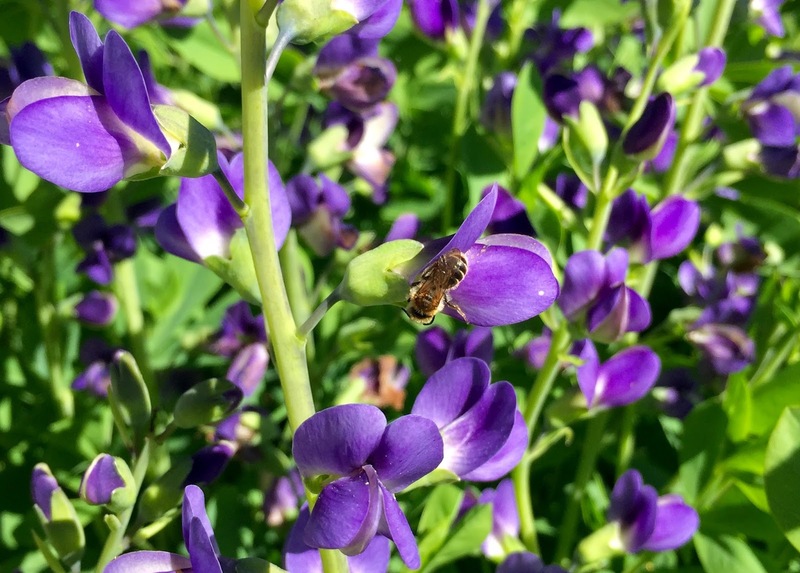 The beginning of June is announced by the blooming of the baptisia. 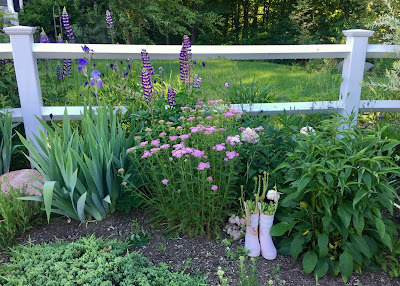 What started out as a small seedling given to me three years ago by a fellow gardener is now a good-sized bush, packed to the hilt with purple blooms. 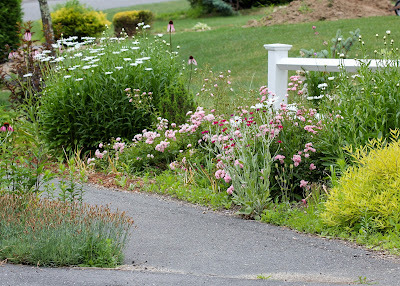 along with the coreopsis, rose campion, and primroses, among others. 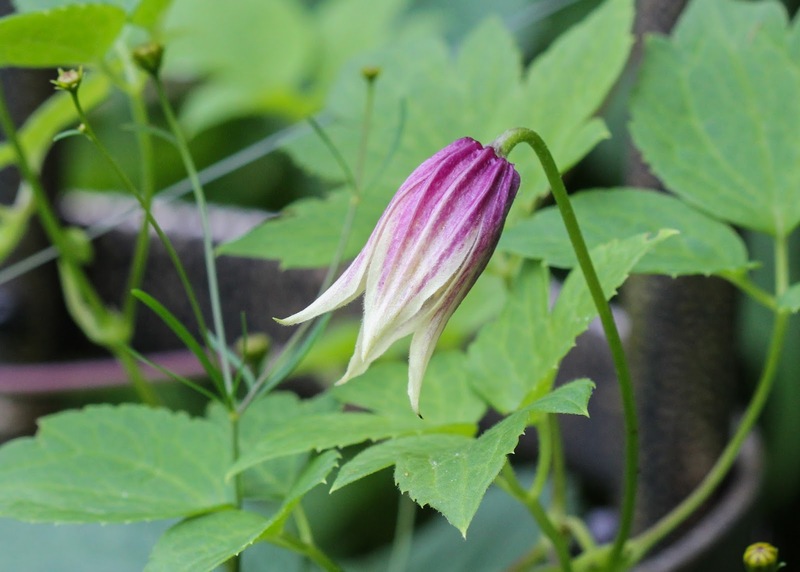 One of my favorite plants is clematis, so each year I keep adding one or two more to the garden, and I always look forward to their blooming. One of the first that I planted, Betty Corning, is now big enough to climb up and around the fence. 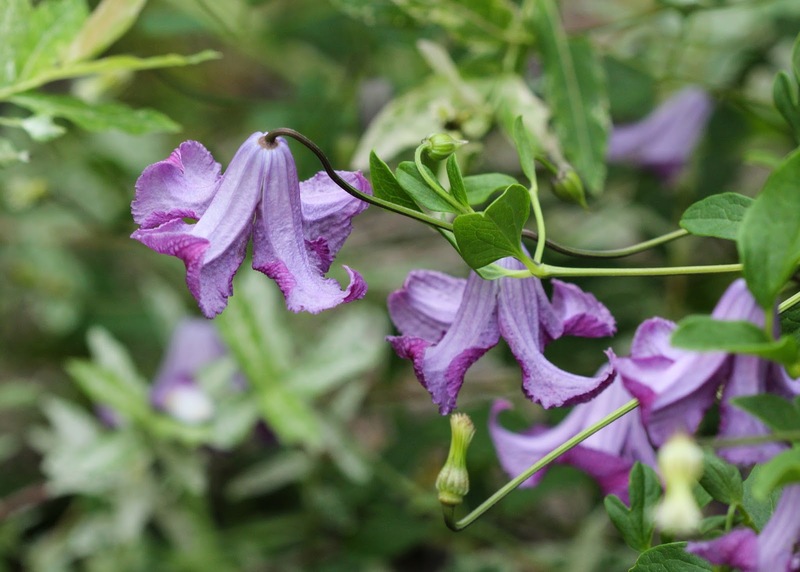 It is known for being one of the very few fragrant clematis, but it really quite stingy with its fragrance - one has to get quite close to smell anything. Lemon Bells is one of my newest clematis that I just planted this spring. Ultimately opening into a yellow bell-shaped flower with a wine-colored top, the first bud is already showing promise. 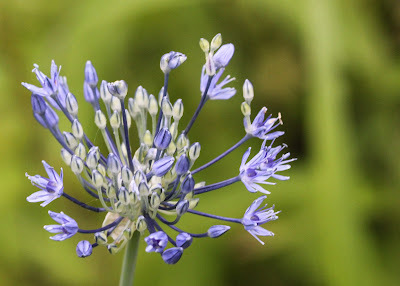 and the blue-flowering Allium caeruleum, which I just had to get for my blue and gold garden. And let's not forget the edibles! I didn't grow any early spring greens this year, so the first provisions out of the garden were rhubarb, garlic scapes, and snow peas. 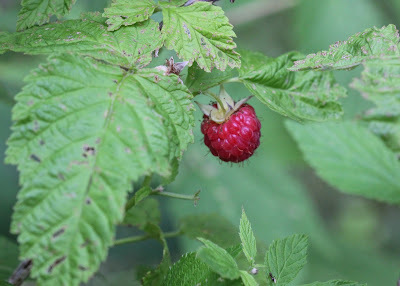 Raspberries are starting to ripen, and the big strawberry plants have completely taken over one of my flower beds. (Note to self: move strawberry plants to somewhere where they can have free rein and go wild.) My lower-growing alpine strawberries seems much more suited as a groundcover that can play well with flowers; currently they have formed a nice low patch in front of the veggie garden. This time of year, every day is a treasure hunt in the garden for my kids. Of course, the garden is always a treasure hunt for me. And then again, sometimes those new things find me. Mortimer the mouse, who turned out to be Mortimina. Weeds? What weeds? The exuberance of the garden in June is a special treat and yours is looking fantastic! Mortimina is adorable as long as she stays outside. I trust you've had that chat with her. I had to have that chat with her after finding her in my greenhouse. 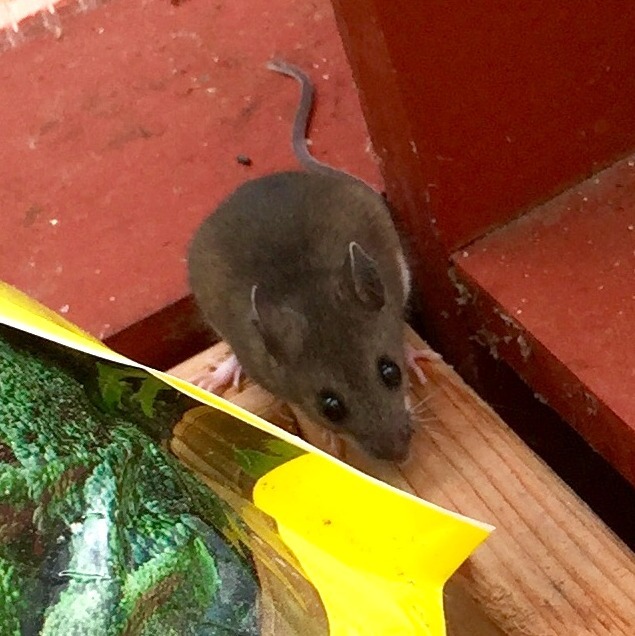 Unfortunately, while she did seem to vacate, she left a present of a nest of babies in a bag of peat moss in there. Yikes! 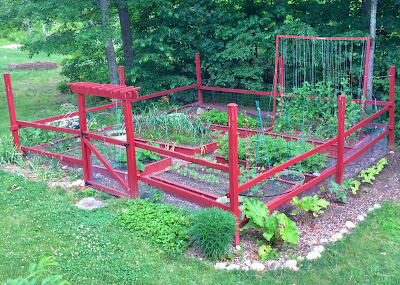 I always admire your well-groomed garden. There are many wonderful plants in it. I also love clematis, they are wonderful climbers. The garden provides a lot of very tasty vegetables: radishes, chives, lettuce, rhubarb ... they are delicious because ecological. Aw, thank you! I love eating produce out of my own garden. And I know how it's been grown! Hi Indie, I love your gardens and never would have known there were weeds if you hadn't pointed it out. This is a wonderful time of year with so much blooming. I just purchased, or rescued from the markdown rack, two of the Campion you have....I hope they make it....they're very pretty. The only mice I see are in our trap! Why thank you! I love finding treasures like that to rescue. I hope they make it and do well! 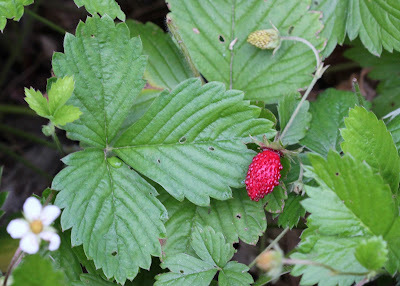 After strawberry season, I plan to pull them up and transplant them to a small hill I have on the side of the house where I think they would make a great groundcover and go wild. The groundhogs have been helping me somewhat with eating strawberry leaves, but I don't really want to encourage them! Oh that is too bad they don't! Now that I have moved up north, though, I get camellia envy... There are always pros and cons in every climate, I guess. Wow, so lush and lovely! I really need to try clematis. The flowers are so pretty. Your hard work is worth it! Thank you! I know clematis are known as somewhat fussy plants, but I seem to have fairly good luck with them if I really prep the hole for them and plant things around them to keep the roots in the shade. There are so many pretty ones. Your hellstrip garden is beautiful. I see no weeds. The first time I read aubout hellstrip gardens on your blog I thought we didn't have those over here. But now I see them even in our neighbourhood. I love it. Glad to hear you have them over there, too! I don't see a whole lot of them here, either, but most people don't have extensive gardens. Just lovely. I used to grow a few colors of baptisia when we lived in the northeast. It simply doesn't do well here. Too bad since it used to one of my favorites. That is too bad! 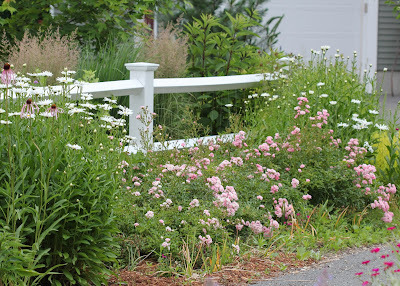 I would love to add more of them to my garden, but I am running out of room for large shrubs. I need to dig up more lawn, right? What a perfect example of the lush exuberance of early summer. It looks great, and I can't see any weeds! Why thanks,though it is because I didn't show that many up close pics :) My goal is to weed extensively for the next few days so I can get some mulch down, now that my self-sowing seedlings have come up. :) I'm a few days ahead of you, weeded last week and am mulching this weekend. Good luck! 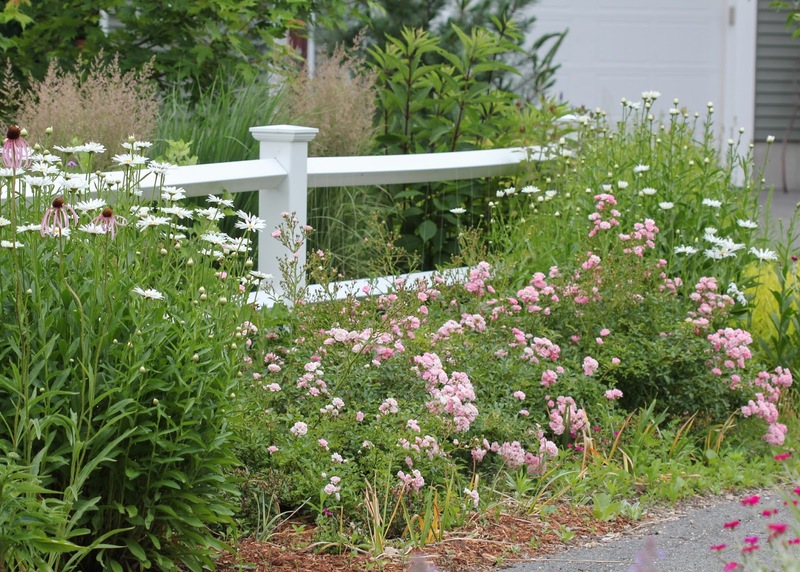 Your garden is a flowery delight. 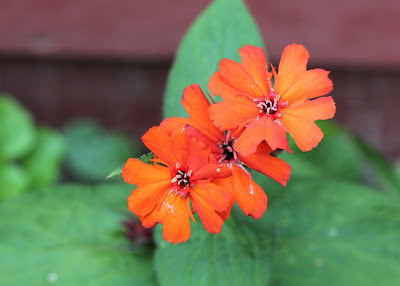 I love the orange campion. I do see we grow quite a few of the same plants. Great job with the hellstrip - very colorful and nicely controlled height. Thanks! I'm not sure if I totally planned everything in the hellstrip, though I tried not to put anything too high in it. I stuck a lot of plants I got for free there, and it worked out quite nicely. I have a lot of self-sowers in there that keep it going. Mortimina is very cute. That's the trouble isn't it. All of mine are too. You let one stay and then.. The garden is looking fab Indie. 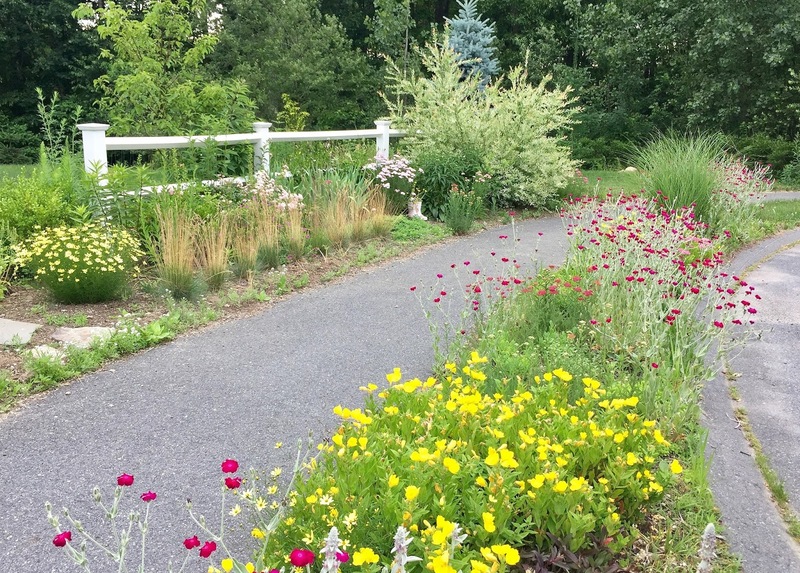 I see no weeds, it looks lovely, and loved.